Dry and seasonably cool weather will continue for the foreseeable future. No imminent signs of storms, but there is potential for a pattern change for the second half of November. Really not too much going on. We've still got a "dirty ridge" keeping us mostly dry. But it is continuing to allow weak disturbances to clip the region. There were a few showers yesterday north of I-80 in the Wasatch. Otherwise, we stay somewhat cool with occasional clouds. In general, we will see a warming and drying trend as we close out this week. However, another disturbance is going to clip us this weekend. Not expecting much in the way of precip from this, most likely effect will be just a 5-10 degree drop in temps from Saturday to Sunday. This early in the season, you are going to see huge amounts of variability, and you have to take some of these numbers with a grain of salt. But, basically Utah is below normal in most basins. 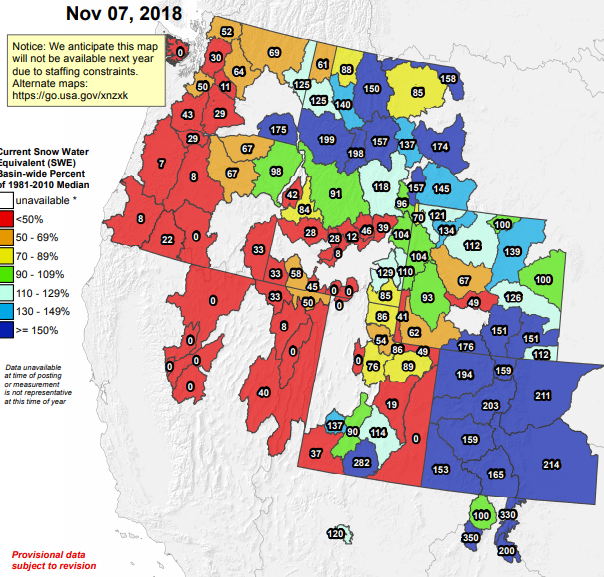 Northern Utah is in the 50-90% range, but I'd expect those numbers to plummet over the next 10 days with no snow in the forecast. You can also see how close we were to the storm track to our north and east. Colorado is entirely in the "well-above normal" range, as is much of Wyoming and Montana. The other way of looking at this, is that it could be worse. Tahoe is pitching a no-hitter so far and the Cascades aren't much better. I cannot emphasize enough how preliminary these numbers are though. One good storm cycle between now and Christmas and we are back on track. Unfortunately, that storm cycle will at least have to wait 10-15 days per the latest models. Really having to dig in the forecast today to find any good signs. The standard range of the GFS and Euro are 10 days. Both models in good agreement that essentially we have 0% chance of anything significant in that period. That takes us thru the 17th. After that, there is a general trend of the pattern very slowly evolving. The last week of November could provide us storms. But this is too far out for any certainty whatsoever. In general, the models favor the ridge moving to the eastern half of the continent, which could allow troughing to develop and the storm door to open in the West. 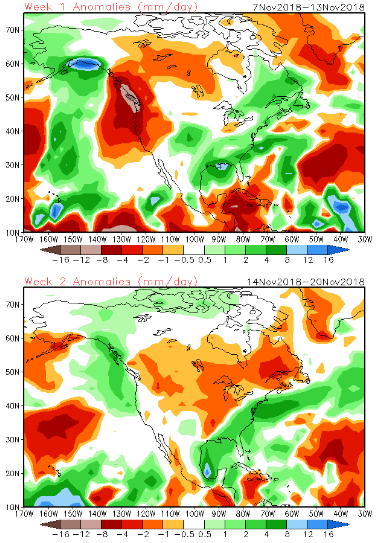 This idea has been reflected in the CFSv2 weekly anomalies for the past few days. 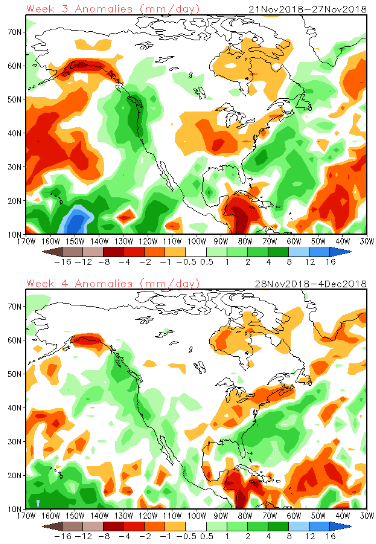 You can see that the CFS has wet anomalies along the west coast and stretching inland for week 3 and 4. Hopefully this means that these long range models are picking up on a change in the pattern. It's most certainly grasping at straws for now. Really, none of this is anything other than conjecture until storms start showing up in 10-day model runs. Keep those fingers crossed. Perform your snow summoning rituals. We'll get there!